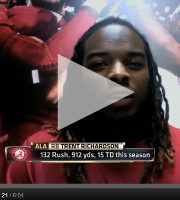 Brock Huard and David Pollack interview Alabama running back Trent Richardson via Skype on the Palmer & Pollack Show. You can obviously see the focus from Trent on the task at hand. He doesn't let the Heisman hype go to his head. Another thing I am glad to hear is that Trent said that so far this season, he feels completely healthy, almost like he is playing in the first game every game. He feels that good. If we can get him through the rest of the season like this, Bama will be in good shape on offense. Another funny story was about how Coach Saban has the remote control door in his office. Check out this video interview. Nice interview with Trent.